Monday I’ll be starting a new fitness and nutrition program called 21-Day Fix. I’m really excited to start this, because unlike other programs I’ve done, this one has the focus on nutrition. Food is one of my happy places. I love searching recipe books and Pinterest for new ideas. Chopping, slicing, sautéing and grilling are stress relieves to me, most of the time. But eating. Eating makes me happy! It always has, which is how I ended up overweight in the first place. Thankfully, now I eat whole foods that my body needs in order to function. No, its not boring and bland. It’s actually fun to turn those items into things you crave and want to eat. 21-Day Fix skips the calorie counting and food journals by replacing them with a color coded container system. It takes a little planning and organizing, but once you have a menu plan in place (which you can find tons of on Pinterest) it’s pretty straight forward! This is a really simple recipe that packs a bunch of flavor. These are considered “Fix Approved” despite the use of soy sauce because it can be found in the nutrition guide in one of the dressings. The best part of this recipe is that you can make a double batch and freeze them, so you have a quick lunch or dinner option in a pinch! These taste just like dumplings! 2. Place all ingredients in a bowl and mix well until incorporated well. 3. Using a scoop (I used the medium Pampered Chef one), make 28 meatballs and place on a baking tray. I was able to fit 6 of them into my red container (I cut one in half to use all space in the container…I’m not losing valuable real estate to air). 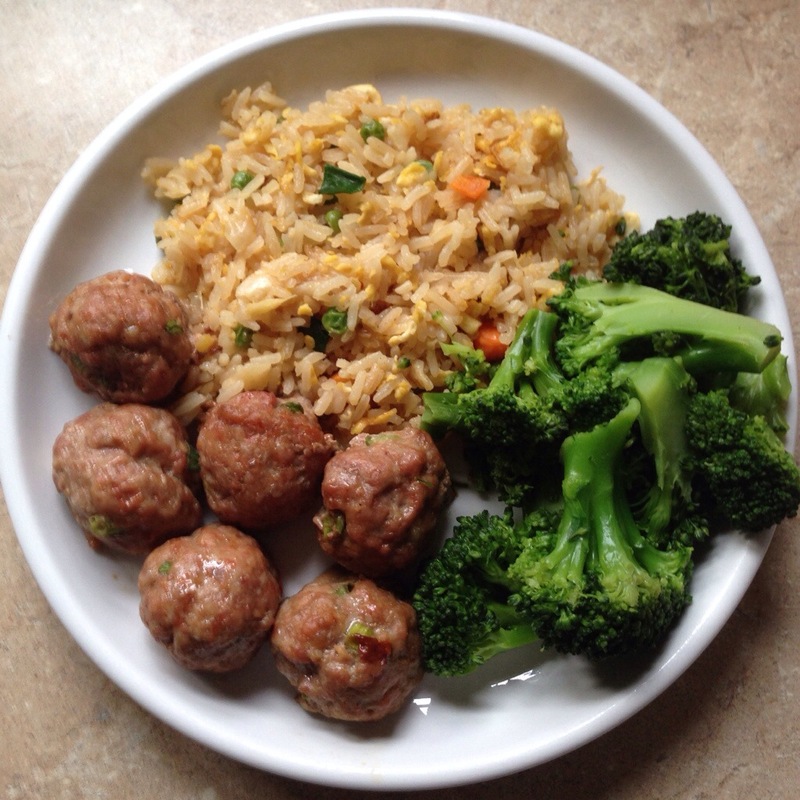 We enjoyed these tasty little morsels with some homemade fried rice and steamed broccoli. Did I mention that they taste just like dumplings?! Steamed dumplings are one of my favorite Chinese Food treats, but since realizing I have a gluten-sensitivity, I had to give them up. Now I get to enjoy my favorite Asian food and red container too! Have you done the 21-Day Fix? Do you have a recipe or go-to meal? I’d love to hear about it below. These look great! I plan to make them tomorrow. Do you take the soy sauce into account, what do you count it as? 1teaspoon? They look delicious. Hi Nathalie, Honestly I didn’t count it and I have been okay. If I wasn’t seeing a change in my measurement or weight I would look everything over and maybe count it as a teaspoon. How long have you been doing 21 Day Fix? How do you like it? what is the recipe for the fried rice? Hi Belinda, I don’t follow an exact recipe for my fried rice. I just cook 1 cup of rice and set it off the side. I then scramble a few eggs and set them off to the side before sauteing some chopped onion, carrot, minced garlic and minced ginger together. I then add some peas and add the rice to the pan to incorporate it all before adding 1/4 cup of soy sauce or coconut aminos. Once everything is incorporated and the rice is heated through, I add the egg and toss one last time. You could also substitute cauliflower rice for regular rice if you are low on yellow containers. I just made these (preped for lunch tomorrow) and it seems like a lot. Could I freeze half of them and cook them later? If so, should I thaw them first or just bake them from frozen? Whenever I make meatballs I make them in bulk. Cook them all, let cool completely and then put in baggies and freeze. I’ve kept them up to a couple months frozen and then just reheat in the microwave and they are still great! Hi! I was wondering how you made the fried rice in this picture and what containers it counted as. Thanks in advance! Hi Rachel, The rice in the photo is jasmine rice which I pre-cooked. I added some garlic, ginger, onion, peas and carrots to a pan to cook, then I added the rice and some soy sauce before adding scrambled egg to the pan and mixed it all together well. I counted this is a yellow and an orange. Another great option to save a yellow container would be to use cauliflower rice in place of the jasmine rice. Then it could be counted as a green and a yellow. Hi Lisa, Yes. It’s about 1 heaping tablespoon. Nikki.,.I made these today (with turkey), so stinkin’ good!! Thank you for the recipe!! LOVED IT! YAY!!! So glad you liked them! I’ve made them with pork, chicken and turkey and loved them all 3 ways. I’ve also add shredded cabbage to them, to make them more like a traditional dumpling. I’m making these tonight just started the 21 day fix today. Awesome! Please let me know how you liked them and how you liked your first day of the program! Are you doing it with a group? My whole family loved this recipe. I subbed the soy sauce for balsamic vinegar and some garlic powder. The ginger is really what makes the whole recipe taste wonderful! Hi Jen! Thank you for sharing your substitutions with me. Garlic and Balsamic sound wonderful….I’ll have to give that a try. I think it would go really well with some zoodles! Hi, Thank you for stopping by my blog! I don’t have an exact recipe for the fried rice, I just steam 1 cup of rice and while that’s going, I scramble up 3-4 eggs and set them off to the side. I then add some chopped onion, garlic, ginger and frozen chopped carrots and peas to my pan. I saute them all together in a tsp or 2 of coconut oil before adding the rice and 1/4 cup of soy sauce (liquid aminos or coconut aminos can be used too.) Stir it all together and add the egg to the mixture. You could add some chopped scallions to it as well. Hi Amber, The entire meal really depends on how you prepare your fried rice and how much you have. A yellow container is 1/2 a cup but if you add lots of veggies to it, you could cover a green container as well. Hi Felicia, You could use ground turkey or beef if you’d like. Just make sure it is lean. Can you use coconut aminos vs. soy sauce? And powdered ginger vs. real ginger? Hi Tiffany, Thank you for visiting my blog and for commenting. Yes, you can use aminos in place of soy sauce and powdered ginger in place of fresh. I would use half the amount of powdered ginger than fresh. Powdered tends to be more concentrated so if you used the same amount it might be over powering. I just made these and they are not only easy but delicious too. Thanks for the recipe. I will definitely be making these again ! About how much ginger did you use? The recipe says an inch but every piece of ginger is different so I don’t want to use too much and I don’t often use it. Hi Anita, I would use about 1 tsp of fresh ginger. If you really like ginger, feel free to add more. Thanks so much! I can’t wait to try these tonight! If you’re using ground/powder ginger, how much should you use? 1 tsp? 1/2 tsp? I tried this before with fresh ginger and I think I used too much because it was over-powering. The meatballs were still good, just looking for a way to tone down the strong ginger flavor. Any suggestions? Thank you! Hi Kristin, I know some people LOVE ginger and some are not a huge fan of it…same with cilantro. I would start with a 1/2 tsp and if you like garlic, you could always go a little heavier with it, if you are afraid they may lack flavor. I just put mine in the oven but was concerned about how “wet” they were. I was concerned that maybe there was too much soy sauce, so I added some cooked quinoa/brown rice mixture that I had made for fried rice. I’m hoping they turn out okay. I also added some cilantro for added flavor. I haven’t had an issue with wetness before. How did they turn out? Those who are gluten sensitive or Celiac should ensure they use GF soy sauce! My stomach is a wreck if I don’t…otherwise a great recipe! Yes!! Great tip!! Thank you for sharing!! What is gf. Soy sause? Hi Debi, Tamari sauce is gluten free and it is really good. The gluten free soy sauce is very funky! I love these!! I freeze them (after they are cooked) and pop them into a container with some veggies for lunch. I’m interested in putting the shredded cabbage in next time. About how much did you use? These were delicious! I shared the link to your recipe on my blog today! I’m glad you enjoyed them and thank you for sharing! How did you make your fried rice?